The Glenbush Mennonite Brethren Church, located near the village of Glenbush in northern Saskatchewan, a member of the Canadian Conference of Mennonite Brethren Churches, was organized on 15 July 1928, under the leadership of N. H. Pauls, with a membership of 17. Its membership in 1954 was 136, and the congregation was still served by its first pastor, N. H. Pauls. The church building was erected in 1930 and was been enlarged four times by the 1950s. In the early years the Mennonite Brethren and General Conference Mennonites met together. The language of worship is English; the transition from German occurred in the 1960s. In July 2003 over 200 people gathered to celebrate the 75th anniversary of the founding of the church. "Glenbush MB Church." Centre for Mennonite Brethren Studies, Winnipeg, Manitoba. Web. 31 July 2011. http://www.mbconf.ca/home/products_and_services/resources/published_genealogies/mb_provincial_conferences_and_church_congregation_records/saskatchewan_archives/glenbush_mennonite_brethren_church_archives/. Mennonite Brethren Herald (27 May 1988): 69; (24 October 2003); (December 2008); (March 2011). Toews, John A. A History of the Mennonite Brethren Church: Pilgrims and Pioneers. Fresno, CA, 1975): 163. Available in full electronic text at: https://archive.org/details/AHistoryOfTheMennoniteBrethrenChurch. Centre for Mennonite Brethren Studies, Winnipeg, MB: Volume 612, Reel 13. Epp, J. H. and Marlene Epp. "Glenbush Mennonite Brethren Church (Medstead, Saskatchewan, Canada)." Global Anabaptist Mennonite Encyclopedia Online. May 2013. Web. 19 Apr 2019. http://gameo.org/index.php?title=Glenbush_Mennonite_Brethren_Church_(Medstead,_Saskatchewan,_Canada)&oldid=163441. Epp, J. H. and Marlene Epp. (May 2013). 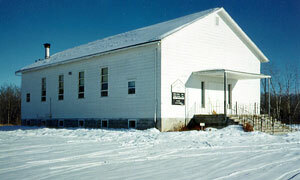 Glenbush Mennonite Brethren Church (Medstead, Saskatchewan, Canada). Global Anabaptist Mennonite Encyclopedia Online. Retrieved 19 April 2019, from http://gameo.org/index.php?title=Glenbush_Mennonite_Brethren_Church_(Medstead,_Saskatchewan,_Canada)&oldid=163441.